The Parent Child +, developed in 1965, is a research-based model designed to build school readiness where it starts: in the home. Below you’ll find staggering statistics about why low-income children enter school well behind their more affluent peers; the research proves that increasing parent-child verbal interaction can have profound impacts on children’s academic performance; and details on how Parent Child+ research-based model consistently achieves its predicted outcomes for low-income children and their parents. Resource meetings provide contact and important information to Parent Child+ Jeffco families and care-givers. End of Program celebrations are equally important. Home visits and quilt give-away. ​By the age of three, low-income children have heard 30 million fewer words then their middle-income peers (Hart and Risley 1995). By kindergarten, the word gap increases to over 40 million and the average low-income child has experienced only 25 hours of one-on-one reading time while their middle-income peers have had over 1,000 (McQuillan, J. 1998). This low level of parent-child verbal interaction is one of the key reasons that so many of the five million children in the United States living in low-income families are unprepared for Pre-K or Kindergarten and enter school significantly behind their middle/higher income peers. This lack of a language and learning-rich home environment does not just limit the development of children’s language and literacy skills, it impacts their numeracy and social-emotional skills as well, inhibiting all aspects of successful school readiness. Too many children have not experienced quality verbal interaction with an important adult in their lives. They have never been read to or explored a book on their own. They have not been exposed to play and interactive experiences that encourage problem-solving, numeracy skills, and appropriate social-emotional development. They do not have the language skills they need to successfully interact with their teachers and their classmates. They may not be able to control their behaviors or emotions as well as other students. Children who enter school this far behind, are likely to remain behind in first grade, and in third grade, and are more likely than their “ready” peers to drop out. A group of passionate Jeffco community volunteers visited Seattle, WA and were inspired by the successful Parent Child+ program serving King County. Nothing of this kind existed in Jefferson County, Colorado. 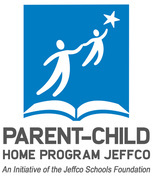 In 2013, Parent Child+ Jeffco became a program of Jeffco Schools Foundation and started to serve 25 families and caregivers of children aged 16 months to 3 years of age over a two year period. In its second year the program added two home visitors and expanded to serve 50 families. Now in its sixth year, Jeffco Schools Foundation continues to partner with the Jeffco Public Schools, Department of Early Childhood Education to implement this program. Parent Child+ in-home approach makes it convenient for under-served families isolated by poverty, language barriers, and lack of transportation to participate in high quality, educational early childhood services. Each family is matched with a community-based early literacy specialist who, if possible, shares the family’s cultural background and language. The visits are a half-hour, twice-a-week over a two-year period, and are scheduled at a time that is convenient for the family. Each week, the literacy specialist brings a new high-quality book or educational toy that is a gift to the family and often the first in the home. Using the book or toy, the visitor models, in the family’s native language, reading, conversation, and play activities designed to stimulate parent-child interaction and promote the development of the verbal, cognitive, and social-emotional skills that are critical for children’s school readiness and long-term school success. Each year, each family receives a minimum of 46 home visits. Over the course of the two years, and 92 home visits, families acquire a library of 46 high quality books and educational toys and 46 curricular guide sheets with tips for verbal interaction, the serve and return of quality conversation; skill development; and additional engagement, literacy, music, and art activities. The home visit staff, who through twice-weekly visits build strong relationships with participants, also connect families to a wide-range of community resources including food, housing, health, and educational services. After completer of Parent Child+, children ages 3-5 will either enter Head Start, attend a licensed child care center, receive family, friend, or neighbor care, or enter Jeffco Pre-K. Jeffco Schools Foundation strives to ensure our Pre-K and Kindergarten students enter ready to learn . Programs like Parent Child+ help Jeffco Public Schools better prepare and meet the needs of their incoming students and reduces the need for additional academic interventions. Parent Child+ Jeffco is guided by a founding advisory committee comprised of community leaders: former Colorado Sen. Norma Anderson, former Colorado State Sen. Moe Keller, Hereford Percy, Buddy Douglas, former Lakewood Mayor Steve Burkholder (co-chair) and Anne Burkholder (founder and co-chair). The program utilizes a non-directive, non-didactic approach, modeling behaviors for parents that enhance children’s development rather than teaching behaviors. Early literacy specialists focus on building meaningful relationships with the families and support parents in realizing their role as their children’s first and most important teacher. They use engaging books and stimulating toys to generate an enthusiasm for and understanding of learning through verbal interaction. Parents are never given homework or assignments to complete but are encouraged to continue quality play and reading between visits with the books and toys they receive each week. The “light touch” deployed by home visiting staff engages and empowers parents, preparing them to start their children on the path to school success, and to take pride in their commitment to, and impact on, their children’s education. Over the past decade, innovations in imaging used in neurobiology have validated the conceptual underpinning of the Parent Child+ model (developed in 1965), the importance of parent-child verbal interaction (Bruner, 1964 and 1966; Vygotsky 1962; Hart & Risley 1995). The evidence highlights that the quality of experiences and relationships in the first three years of life has a deep and lasting impact on how the brain develops. The richer the environment, the greater the number of brain cell interconnections that are made. The larger the number of interconnections, the faster and more meaningful learning will be. Interactions or relationships shape children’s brains. The more loving and responsive the caregiver is, the greater the foundation for later social interaction. The evidence-based Parent Child+ model provides two years of intensive, twice-weekly home visiting to under-served families with children between the ages of 16 months – 3 years, who are challenged by poverty, isolation, limited educational opportunities, language and literacy barriers, and other obstacles to healthy development and educational success. Through the visits, Parent Child+early literacy specialists educate parents on the importance of parent-child interaction and give them the tools (books and educational toys), skills, and encouragement to engage their children. For almost 50 years, Parent Child+ has been bridging the achievement gap for low-income children by strengthening the parent-child relationship and, ultimately, increasing the language, literacy, and cognitive skills, and the social-emotional development critical to school success. Make a donation anytime to support our work. Visit us at ColoradoGives.org to make a one-time or recurring donation!